Early in the session, Christine Laine, editor of Annals of Internal Medicine, reminded attendees that “transparent reporting, by itself, does not make good science.” Then why, you might ask, should we pay attention to reporting guidelines? Because it makes good science even better. If a “minimum set of items required for a transparent account of what was done and found in a research study” is provided, other researchers are more able to understand, appraise, and replicate the study. Laine believes that reporting guidelines should be used by researchers to improve the transparency of a study, by peer reviewers to check for adequate reporting, and by editors to ensure adequate and transparent reporting. She likened reporting guidelines to turning on a light before you clean a room: it does not clean the room for you, but it shows you what needs to be cleaned or better organized. According to Jason Roberts, executive editor of Headache and senior partner of Origin Editorial, the most common issues with reporting usually are in the methods section; for example, according to a study conducted internally by the editorial office, 50% of rejected manuscripts failed to mention how a study was randomized. He reminded attendees that although reporting guidelines might feel like bureaucratic red tape at first, it is important not to think of them in this way. They should be seen as a benefit to journals (leading to increased quality and consequently boosting readers’ experience, reproducibility, and transparency), to authors (leading to increased quality and chances that a study will be read and cited), and to the literature. 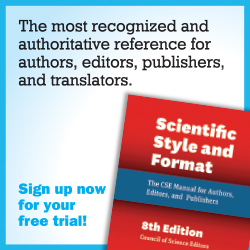 In tandem with the launch, it is imperative to promote the policy by educating readers and potential authors and reviewers with an editorial (written by the editorin-chief and journal leaders), e-mail campaign, and inclusion of the policy in the instructions for authors, reviewer guidelines, and journal’s Web site. Finally, be sure to follow up on the success of the policy by collecting and analyzing changes in submissions and adherence to reporting guidelines. During the question-and-answer portion of the session, attendees learned that journal adherence to reporting guidelines is not being policed, but the use of reporting guidelines is endorsed by the International Committee of Medical Journal Editors.4 The EQUATOR Network’s Web site includes templates, letters, instructions, and the like, but it has not yet posted a sample policy. Roberts volunteered to share the session questions and comments with the EQUATOR Network to assist with future improvements of its Web site and practices. Reportedly, 34 physical-therapy or rehabilitation journals have pledged to require adherence to the CONSORT statement in 2015. 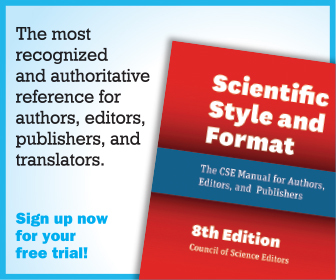 Will your journal’s specialty or subspecialty be next? CONSORT. Transparent reporting of trials. www.consort-statement.org/. Accessed 19 May 2014. Equator Network. Enhancing the quality and transparency of health research. www.equator-network.org/. Accessed 19 May 2014. Equator Network. Enhancing the quality and transparency of health research. Toolkits. www.equatornetwork.org/toolkits/developers/. Accessed 19 May 2014.
International Committee of Medical Journal Editors. www.icmje.org/recommendations/. Accessed 19 May 2014.